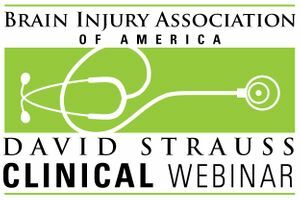 A David Strauss Memorial Clinical Lecture webinar set of seven (7) webinars on Cognitive Rehabilitation. Click "Download" below to be redirected to the checkout page. After completing the checkout process, you will receive an email with further instructions. The file contained in this email also includes instructions about receiving your ACBIS CEUs. Introduction to Cognitive Rehabilitation presented by Michelle Ranae Wild, M.A.. Awareness presented by Sheldon Herring, Ph.D. Attention presented by John Whyte, M.D., Ph.D.
Executive Function presented by Bridget Lowery, B.A., CBIST, and Jessica Chappell, M.A., CBIST, Main Line Rehabilitation. Deficits of Initiation/Action presented by Deirdre Dawson, Ph.D., Rotman Research Institute at Baycrest Health Sciences, Toronto. Social and Pragmatic Communication presented by Rebecca D. Eberle, M.A., CCC-SLP, BC-ANCDS, Indiana University, Department of Speech and Hearing Sciences. Memory Deficits and Rehabilitation presented by Thomas Bergquist, Ph.D., L.P., Mayo Clinic. The webinars may also be purchased individually using the links above.